When we think scales, we tend to go straight for the type sitting, mockingly, on the bathroom floor. But there are also kitchen scales, which will make your baking look much more official and can double as postal scales — for when you’re trying to figure out if you can afford to send someone a care package, or whether a digital gift card wouldn’t really be just as nice. Still, the kitchen scale can be a tough sell. Do we really need another appliance on the counter? But after we talked to some culinary pros, we were actually eager to cede some counter space. Not just because the New York Times called the tool “one of the most useful gadgets” in the kitchen and we want to do whatever Melissa Clark does. Because it legitimately sounded like it would take the baking projects we keep pinning to our Pinterest boards from digital dream life to real life. And a life with more brownies and lemon bars sounds good to us. Perhaps you’ve avoided the kitchen scale because it seems so fussy. “People are often like, ‘I’ll be damned if I’m going to measure water in grams. Pry my measuring cups out of my cold dead hands,’” says Jessica Easto, author of Craft Coffee: A Manual. But the pros say the kitchen scale is useful precisely for those of us who can’t be bothered. It essentially turns any recipe — whether we’re talking a 17-ingredient chicken curry, chocolate cupcakes, or éclairs — into a one-dish endeavor. Which means you’ve been freed from the tyranny of the dirty sinkside pile-up of measuring cups and spoons so you can do better things with your life, like, mentally prepare to eat all those cookies. Sorry to say, not all ingredients are created equal. Depending how tightly a bag of flour is packed and how much muscle is wielded when dipping it out, a cup of flour scooped and leveled can weigh anywhere from four to six ounces. That’s a significant difference in a batch of chocolate chip cookies — and a death knell for more complicated recipes. Plus, why waste precious ingredients like crystallized ginger, smoked almonds, and fine chocolate to inaccuracy? 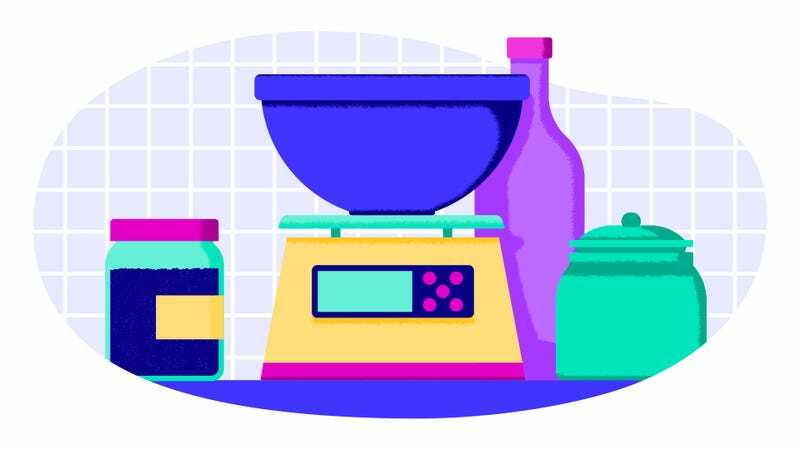 “When the accuracy and consistency of a measuring cup can be out by as much as 20 percent, using a scale is a no-brainer,” says Deborah Thompson of The Salted Mint. And it’s a godsend for hard-to-measure and messy ingredients. “It’s a dream when you’re measuring something tricky like butter,” Thompson said, which is “notoriously awkward” to accurately measure in a cup, or peanut butter, which leaves a sticky mess. Skip the third-wave coffee shop; Easto says a kitchen scale will help you make a better brew at home (and she literally wrote the book on that). Whether you occasionally make a morning cup that’s too strong or, god forbid, too weak, a kitchen scale keeps you from shooting from the hip. And, like baking, you can skip the extra measuring cups and spoons, which Easto says just makes brewing easier. Put your handsome pour-over vessel on the scale, zero it out, and add boiling water until the scale reads the desired number of grams. Yes, you can skip the post office line and use your kitchen scale to weigh the package of costume jewelry you just sold on eBay. And you can also play home pharmacist. All of which leads us back to the overlord scale, the one taunting us from the bathroom. Every expert swore by a kitchen scale to keep their portion sizes in check. What does three ounces of salmon look like, anyway? Sarah Young writes about food and the people who make it. She likes to keep her dinner plans loose and her drinks stiff.